One of my favorite ways to unwind is to play a round of golf. I love a challenge, and golf is always a challenge. Just ask Tiger. Yet, if you’re like me, you’re more at risk of throwing out your back swinging than getting a chance at a green jacket. I see several golf injuries each season coming through my clinic Go To Ortho. Everything from sprains and strains to broken ankles or knee injuries. It may not improve your handicap but here’s a little insight from an orthopedic surgeon to keep you on the green. Golf injuries can be loosely grouped into three categories: pivot and twist injuries; repetitive motion injuries; and slips and falls. As you swing your golf club, you are using muscles throughout your entire body to twist and pivot. If you haven’t spent any time recently strengthening or warming up your core or leg muscles, this twist and pivot motion can result in pulled muscles and strains, which causes back pain, neck pain, and even knee and hip injuries. Warm up: Warming up is an important step. Even physically fit players can get a strained muscle if they don’t warm up properly or if they are swinging incorrectly. I saw this on the Golf Channel and it introduces some great stretching you can do. Strength training: Some training with or without light weights is also a great way to prevent injuries in general. Here’s how to modify your strength training to prevent back pain while strengthening your core. Moderate your play: Although it’s hard to do, I’ll say it anyway: avoid a weekend warrior mentality. Slowly work up to longer periods of practice and play rather than going all out at the first sign the sun’s out. Swinging a golf club again and again can cause repetitive motion injuries like tendonitis and bursitis in the elbow, hand, shoulder and ankle. Inflammation in the elbow is called tennis elbow or golfer’s elbow, depending on which area is affected. You can also develop tendonitis in your ankles, hands and the rotator cuffs in your shoulders. Warm up: The stretches mentioned above will help prevent repetitive motion injuries too. In addition, read the Go To Ortho blog to learn stretches and exercises to prevent rotator cuff injuries. Take breaks: Besides warming up before your game, take short breaks while you practice your swing. It gives time for the muscles to rest and recuperate before doing the same motions again. Work on your technique: You can help prevent repetitive motion injuries – and lower your score – by working with a golf instructor on your technique. A proper grip and swing really can help prevent these kinds of injuries. Falls, like Dustin Johnson had before the Masters, are the most common cause of injuries treated in emergency departments across the country. According to a 2016 risk report by the insurance company Travelers, 33 percent of accident claims at golf courses are due to slips, trips and falls. Be aware: Be aware of your surroundings. People trip over uneven ground or by missing a step or two on the stairs. Often times they are not paying attention when getting in an out of the cart because they are preoccupied with their game or socializing. Take a moment to look before you step. Consider your footwear: Golf course rules about footwear vary, but wearing studded golf shoes will help you maintain your footing on the green and prevent some slips and falls when, for example, climbing out of the sand pit or searching for balls in the rough (or trees). Learn how to fall: You don’t have to be a stuntman to learn how to fall properly. As you fall, bend your knees and elbows. Don’t reach out to catch yourself with your hand – that can result in a broken wrist – instead, turn so you land on the soft part of your body. Your muscles will help absorb the impact. Check out more falling strategies from professional stuntwoman Alexa Marcigliano. 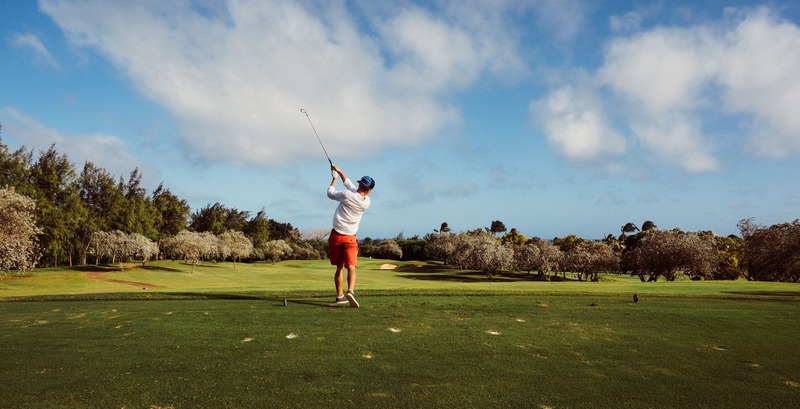 If you are careful to prevent these common golf injuries, and if you forego the golf cart and walk the links, golf can provide wonderful health benefits. Being outside makes you feel better too (as long as you don’t duff your shot, that is).